So many types of produce come in mesh bags – from onion sets to citrus fruits. I hate to just throw them out, and I can only reuse so many for storage, so I decided to upcycle some of the produce bags into easy, no sew kitchen scrubbies. If you have more than you can use yourself, they also make a nice addition to a natural cleaning gift basket. I found that four mesh bags from oranges made a firm scrubbie that fits well in my hand. Ideally, you'll want to use bags that were opened from the end so they are easier to work with, but I used the ones that had holes in them as filling and the bag that had a small hole at one end for the outside. I used four bags of the same size that had previously held oranges. Neatly trim off the ends of the produce bags and any dangling threads. Set aside the bag that's in the best condition for the outside of the scrubbie, and roll up the other three bags like donuts. 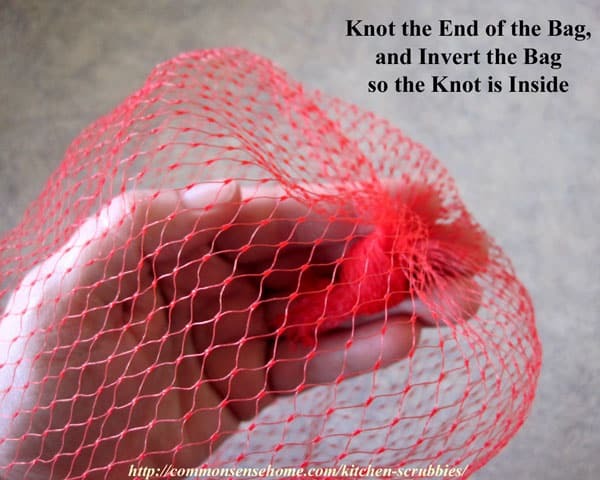 Knot the end of the reserved bag, then invert the bag so the knot is tucked inside. Fill the bag with the other three rolled up bags. Fold the raw end of the exterior bag down to tuck in loose ends. 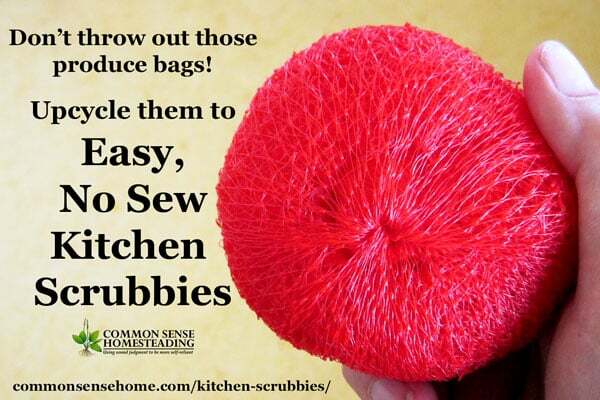 Squeeze the filling bags down tight and knot the loose end of the exterior bag to secure and finish the scrubbie. When you use the scrubbie, hold it with the knot facing the palm of your hand to help keep it secure. Alternatively, you could overlap the end neatly and stitch them down with dental floss, but a knot is quick and easy. And that's all there is to it! 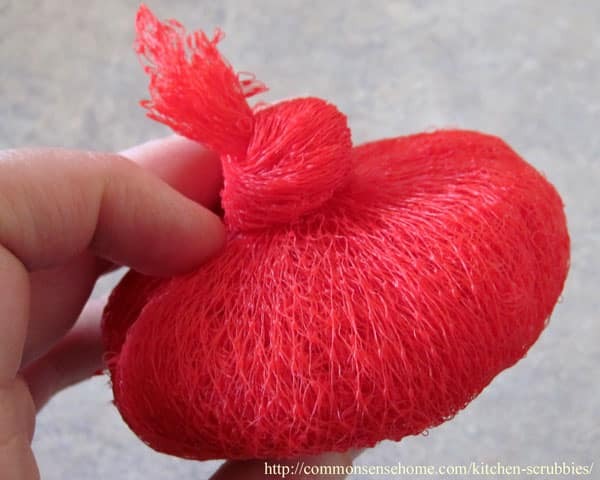 In just a few minutes you can give new life to something that most people would just toss in the trash and create a handy homemade scrubbie for your kitchen or bath. Last summer I replaced glued-on rubber-backed carpet tile with some nice italian tile and, of course, had to clean off some pretty nasty glue goo from the concrete floor. Big room, plus half bath, hallway, pantry, HVAC closet, laundry “closet” — essentially the entire floor on the bottom of my tri-level. 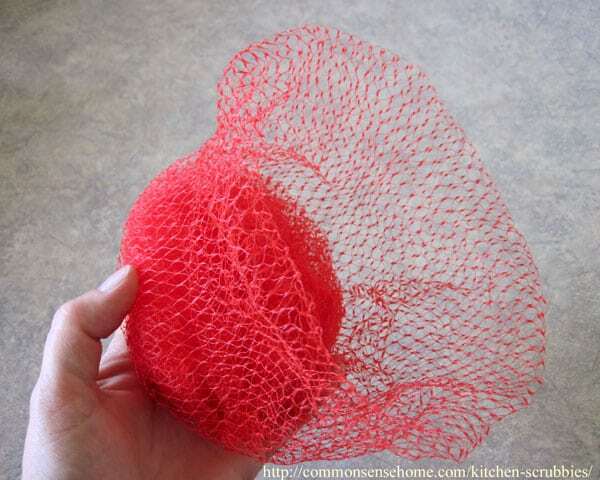 I used a pan of water with laundry detergent in it, and a plastic net turkey bag as a scrubber. Just wadded it up, no knots or anything. It did a great job, lasted through the whole job, and cleaned with just a swish in a bucket of water. Considering what food costs these days, it’s wonderful to get a useful item with the purchase for *free*. No doubt. Might as well get everything you can out of a purchase. Thanks Laurie! This is so easy and simple. 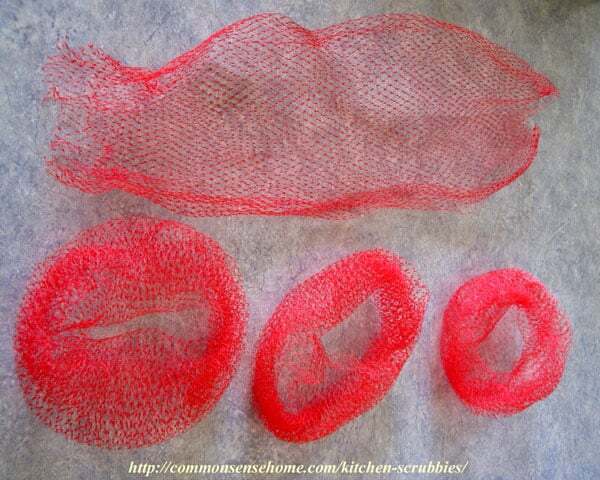 Years ago I used to crochet netting to make scrubbies. They looked nice and were thick enough, but certainly took a little bit of time. It’s nice with this method that one can make them as big or small or thick or thin as needed. My husband just recently asked me if I wanted to keep the bag the lemons came in and I said no. Won’t do THAT anymore! Happy Thanksgiving! I’ve seen some of the crochet ones and they are really nice, but I never learned how to crochet and my free time is always eaten by other projects, so quick and easy is the route for me right now. 🙂 We had nice visits with family and are just having a low key day today. Can you post that crochet pattern? Here’s an all purpose scrubbie crochet pattern. Hmm… these look great! 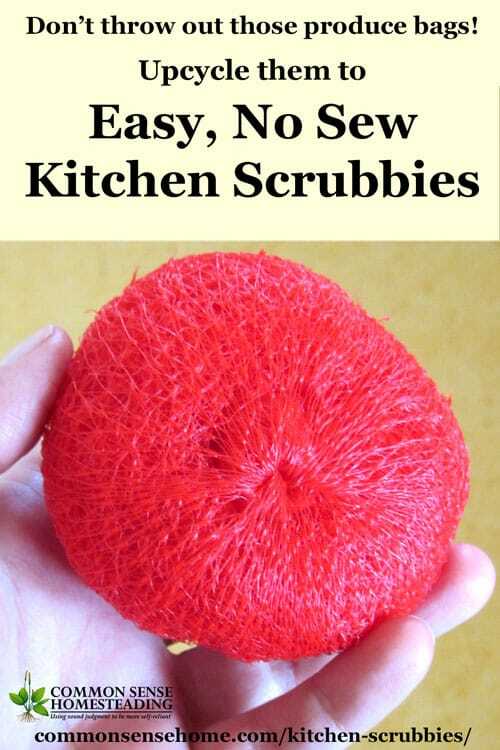 I’ve been looking for a replacement for my favorite kitchen scrubbers that I can no longer get. My only concern would be bits of food working their way through the netting into the inside of this…. have you had any trouble with keeping these clean of “gunk”? Not really. I just rinse scrub the scrubbie around in the dish water and give it a rinse. If you have a locked area (to hold small items) in your dishwasher, that would probably work, too. It works! And it’s free! Thank you!